We no longer have these dumbbells available. York has discontinued them. You can find many sizes of legacy and vintage York roundhead dumbbells on ebay. The York Legacy dumbbell is a throwback to the vintage York round "cannonball" style dumbbells. The straight handle is solid steel, 32mm thick, fully knurled. The exception is the 1-10 lb sizes, which have cast iron handles instead of steel. As part of the manufacturing process, the ends of the handles are pressed into fishtails and then covered with molten iron inside the cast iron heads, preventing the heads from loosening like some other dumbbell brands. Another unique feature is each dumbbell has a small flat part on the round heads to prevent it from rolling around if you set it down on that spot. The handle is about 4.5" long. This is shorter than some other models and feels better to most people. However, keep in mind that they will not fit some dumbbell racks that require the handle be a certain length. A small portion of these York Legacy dumbbells have a patchy looking finish, exposing a different black paint underneath. 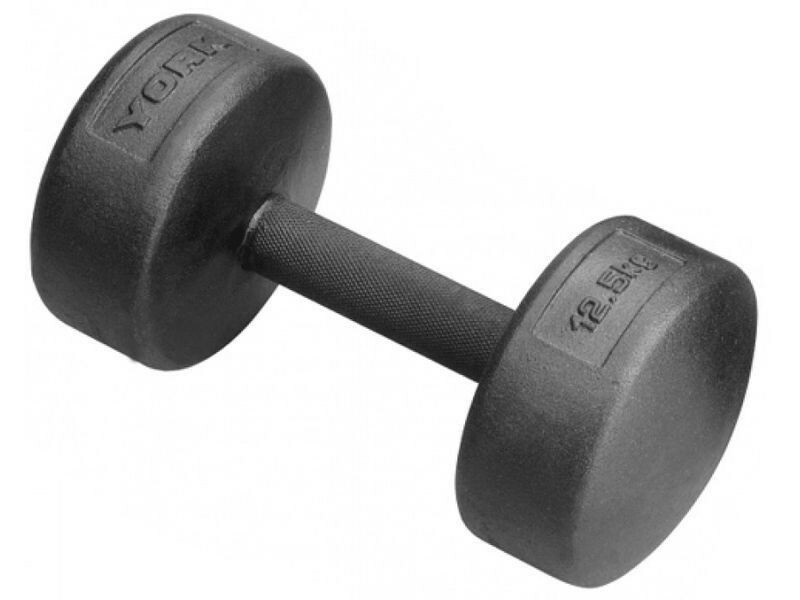 They are not more prone to chipping, so York does not consider this a major issue and will not replace them, and we in turn cannot offer you a guarantee regarding the finish, unlike most of our other dumbbells. Consider these to be low priced "workhorse" dumbbells that may or may not look great. We are not sure what percentage of the dumbbells have this issue, but so far we have only received a small number of complaints. If you require a consistent looking finish for aesthetic purposes, you would be better off ordering one of our other models.